Edit: I just use a regular sewing machine and needles to sew on my cards. You may have to check your tension and you'll want to try it out on scratch paper first, but I didn't have to do too much in the way of adjustments. The only thing I have to do periodically is clean the adhesive build-up off the needle! Hope that helps! I am in dire need of some thank you cards now, so that's what you'll probably be seeing for awhile! My card for today uses Jen's Sketch For You To Try from 5/16/09. I started my design by following the sketch pretty closely, then once I got creating, I veered from it a bit. Does that ever happen to you?! 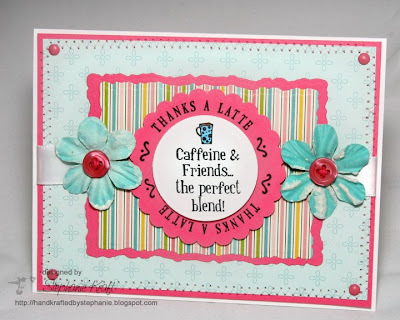 I used the newly released set from JustRite stampers, Just a Little Caffeine Borders & Centers, for my center image. You can purchase this from The Scrapbooking Cottage. The border is from the JustRite set, Celebrations Demi Phrases. This is also the last day to save 15% on Copic Ciao marker sets in the store. I hope you have a wonderful Memorial Day weekend! Thanks for stopping by! Accessories: Circle and Deckled Rectangles Nestabilities (Spellbinders), Cuttlebug (Provo Craft), Markers (Copic), Scallop circle punch (Marvy), Flowers (Prima), Buttons (PTI), Brads, Ribbon, Foam tape, Thread, Sewing machine. Too cute! Do you use a special needle for your sewing machine? Or just regular needles?